Zoodles with Ground Turkey and Sauce - What a Good Eater! As promised, here is our ZOODLES recipe video! We make our zoodles with ground turkey and sauce. You can grab the full recipe below, but if you’re curious, the turkey is an adaption of our “Baby Beef and Greens” recipe from the cookbook, and our sauce is our favorite “Basic Marinara Sauce,” also from our cookbook – we make this in bulk and stockpile it in small batches so we can quickly grab and defrost. So, if you’re looking for a healthy, hearty family dinner idea, look no further than our ZOODLES with Ground Turkey and Sauce! Gluten-free, dairy-free, and ready in under 30 minutes, this toddler-friendly meal is just as satisfying for adults. Sorry, but we can’t promise you’ll have leftovers on this one! Buon appetito! Spiralize your zucchinis using your preferred method. (We use our Kitchenaid spiralizer attachment. We also love our handheld spiralizer – this one is great for an arm workout!) Set aside. Place a skillet over medium heat. Add the extra virgin olive oil. Once warm, add the onion. Saute for about 5 minutes, until soft and translucent. Add the garlic and stir for 30 seconds to prevent burning. Add the ground turkey, break it up with the spoon, and cook until browned, approximately 5-7 minutes. Add the salt, pepper, Italian seasoning, and vegetable broth, bring to a boil, and cook for another 5-7 minutes. Bring a large pot of salted water to a boil. Add the spiralized zucchini and cook for no longer than 5 minutes. Strain, place in a large bowl, and top with ground turkey and your favorite sauce (optional). Serve! Did you like this recipe? Check out the What a Good Eater! cookbook for fantastic ideas on family-friendly meals, sample food schedules and menus by age, healthy snack ideas by age, and meals ready in about 30 minutes or less for busy parents. 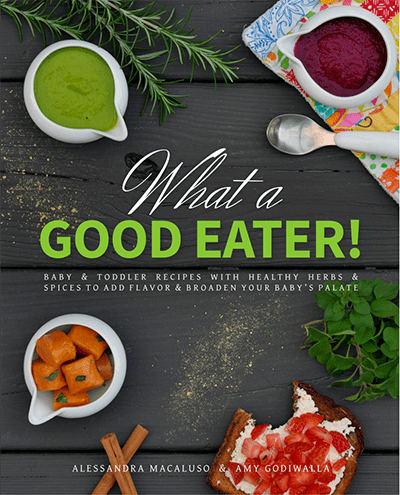 Sign up for our mailing list, here: What a Good Eater newsletter. And don’t forget to subscribe to our podcast, where you’ll hear tons of tips, tricks, and food-related talk about family meals!